At least 71 people were hospitalised after the attack, with 10 in critical condition. GOVERNMENT WARPLANES DROPPED suspected chlorine bombs on a crowded neighbourhood in Aleppo on Tuesday, injuring dozens of people, according to Syrian activists and rescue workers in the rebel-held part of the contested city. 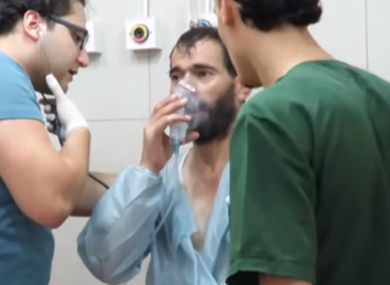 A medical report from one of the hospitals in the besieged eastern part of Aleppo said at least 71 people, including 37 children and 10 women, were treated for breathing difficulties, dry cough, and that their clothes smelled of chlorine. The report said 10 of the patients are in critical care, including a pregnant woman. Ibrahem Alhaj, a member of the Syria Civil Defence first responders’ team, said he got to the scene in the crowded al-Sukkari neighborhood shortly after a helicopter dropped barrels containing what he said were four chlorine cylinders. He said he himself had difficulty breathing and used a mask soaked in salt water to prevent irritation. At least 80 civilians were taken to hospitals and treated for breathing difficulties, he said. A video by the rescuers shows children crying and men coughing. “Most of those injured were women and children,” he said. “It is a crowded neighborhood.”The head of the Britain-based Syrian Observatory for Human Rights said 70 people suffered from breathing difficulties after ab attack in al-Sukkari on Tuesday. The Observatory’s chief, Rami Abdurrahman, said he could not ascertain if it was chlorine gas attack. Chlorine gas is a crude weapon that can be fatal in high concentrations. In lower doses, it can damage lungs or cause severe breathing difficulties and other symptoms, including vomiting and nausea. Accusations involving use of chlorine and other poisonous gases are not uncommon in Syria’s civil war, and both sides have denied using them while blaming the other for using it as a weapon of war. Last month, there were at least two reports of suspected chlorine attacks in Aleppo also, while the Syrian government also blamed the opposition for using the gas. A team of international inspectors determined in late August that the Syrian government and Islamic State militants were responsible for chemical attacks carried out in 2014 and 2015. But the UN Security Council failed to agree on whether to impose sanctions on the government in line with a September 2013 resolution authorising sanctions that can be militarily enforced for any use of chemical weapons in Syria. The resolution followed Syria’s approval of a Russian proposal to relinquish its chemical weapons stockpile and join the Chemical Weapons Convention. That averted a US military strike in response to an alleged chemical weapons attack that killed hundreds in the Damascus suburb of Ghouta. Russia, a close Syrian government ally, has blocked sanctions against President Bashar Assad’s government. Fighting in the deeply contested city of Aleppo has not let up despite international efforts to establish a cease-fire. On Sunday, Syrian pro-government forces backed by airstrikes launched a wide offensive in the city, capturing areas they lost last month and besieging rebel-held neighborhoods once more after a breach in the siege a month earlier. On Tuesday, a Turkish spokesman said Turkey was pushing for a ceasefire in Aleppo that would extend through the Muslim religious holiday of Eid, which due to begin Monday. Spokesman Ibrahim Kalin said President Recep Tayyip Erdogan spoke to his US and Russian counterparts during the G20 meeting in China about the ceasefire. Kalin told private broadcaster NTV Tuesday that the initial plan was for a 48-hour ceasefire. Email “Warplanes have dropped suspected chlorine bombs on a crowded neighbourhood in Aleppo ”. Feedback on “Warplanes have dropped suspected chlorine bombs on a crowded neighbourhood in Aleppo ”.